When Google released Android 2.2 "Froyo", the upgrade of "Eclair" (Android 2.1) they introduced the ability to set up a Wi-Fi hotspot. A Wi-Fi hotspot allows you to use any phone running "Froyo" to act as a wireless modem using the phones data network (mobile internet). This opens up the ability to have the internet wherever you go, so say your on the train and want to browse the internet with your laptop, all you need to do is set up the hotspot and your read to go as long as you can recieve a mobile internet signal. The first step to setting up the hotspot is opening the settings screen on your phone. To do this press "Menu" on the home screen and then click on "Wireless & networks". Inside this menu you should see an option saying "Portable Wi-Fi hotspot settings". 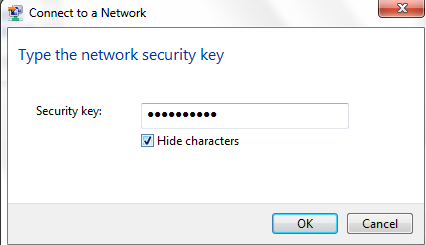 In here set up the name of the hotspot and a password (if you want to have one) and then click on the tick box beside "Portable Wi-Fi Hotspot". and find the connection that has the name you set up on your phone. 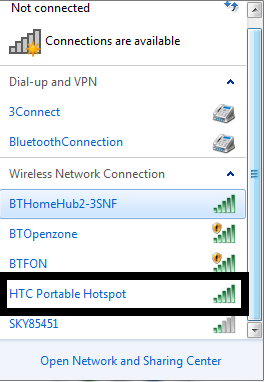 As I was using a HTC Wildfire for this example I've set up the connection as "HTC Portable Hotspot" though feel free to call it anything you wish. 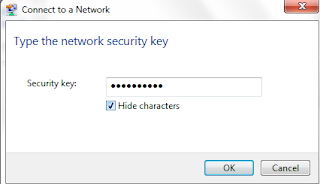 If you had a password set up on the connection for security you will then be asked to enter it. After doing this you "should" be ready to go. For some reason whilst doing this guide I managed to stumble into some form of problem, clicking on "OK" seemed to send Windows into correcting the error. Repeated attempts to replicate the error haven't seen them come up so I'm not too sure what the error ACTUALLY was. To stop the connection go back into the "Wireless & network" settings and untick "Portable Wi-Fi hotspot". Whilst it's a useful feature and it is well implemented in phones running Froyo a few issues do need to be pointed out before you start. Firstly using a phone as a Wi-Fi hotspot will drain the phones battery at a quicker rate than usual which can be problematic though maybe a bigger issue is that the phones internet allowance will be eaten into. Unless you are on an unlimited internet deal I'd advise being careful when using a phone as a hotspot as you can run up a bill from the network data. It's also worth noting some networks have made it difficult to use a phone as a modem, often if you call your network they can help you sort out any issues and barriers they've put in their users way.